The 2012 Focus goes on sale next month. It will come in two body styles: a four-door sedan, above, that starts at $16,995 and a five-door hatchback that starts at $18,790. Both prices include shipping. DETROIT — The redesigned 2012 Ford Focus compact has been certified by the EPA at 40 mpg on the highway and 28 mpg in city driving, Ford Motor Co. said today. Those numbers are roughly the same as those for Ford's smaller Fiesta car, setting up a potential marketing problem for the automaker. The Focus' fuel economy ratings are for the version with the Super Fuel Economy package and a six-speed automatic transmission. The Focus SE with that package carries a sticker price of $19,655, including destination. The Ford Fiesta subcompact with the same package is rated at 40 mpg highway and 29 mpg city. The Fiesta SE sedan starts at $14,995, including transportation. The SFE Super Fuel Economy package adds $695 to the price tag, a Ford spokesman said. Excluding the package, the Fiesta is rated at 38 mpg highway and 29 mpg city. The new Focus is debuting just as the Department of Energy is predicting higher gasoline prices at the pumps in the months ahead in part because of political unrest in Libya, a major oil exporter. Gasoline prices could rise to $3.50 a gallon, and some pundits have predicted $5 a gallon. The current national average price for gasoline is $3.31 a gallon, according to nationalgasaverage.com. The Focus joins a slew of new or redesigned small cars from Chevrolet, Hyundai and Honda that all promise higher fuel economy than their predecessors. Last week, Honda said that this spring it will introduce a redesigned Civic HF model with a 1.8-liter gasoline engine that is expected to get 41 mpg in highway driving. Jim Farley, Ford's global marketing chief, said the automaker is "fortunate" to be bringing out a redesigned compact car in the midst of rising gasoline prices. "In 2008, when the fuel prices escalated, we were launching the F series. And many reporters asked me, 'Hey, Jim what's it like launching the F series in the face of $4 a gallon gas?" Farley laughingly said at an event in New York yesterday. "The segment that grew the most the last time gas prices escalated in the U.S. was the compact segment." Farley said the Focus' competitive fuel economy -- when compared directly with the Fiesta -- won't usurp Fiesta sales. He said it's "pretty typical" for subcompacts to trail compacts in fuel economy despite being smaller vehicles. "There is more engine technology in (compact) cars than in the (subcompacts)," Farley said. "But the Fiesta is still the top fuel economy leader in its segment, and the Focus will be at the top of its segment." Ford said the vehicles target two different buyers. The Fiesta tends to skew toward buyers in their 20s, and the Focus attracts an older set. The 2012 Focus is expected to go on sale next month. It will come in two body styles: a four-door sedan that starts at $16,995 and a five-door hatchback that starts at $18,790. Both prices include shipping. The fuel economy ranking of the Focus with the Super Fuel Economy package puts it neck-and-neck with its main competitor, the Hyundai Elantra, which is rated at 40 mpg highway and 29 mpg city. 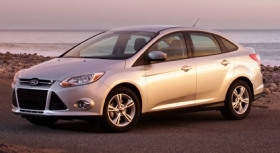 The Focus is Ford's fourth vehicle with an EPA-certified rating of 40 mpg or more. "Our customers tell us that fuel economy is the top reason for purchasing a Focus," said Derrick Kuzak, group vice president of Global Product Development, in a statement. Ford's other models to achieve at least 40 mpg are the 2011 Fiesta SE with the fuel economy package, the Ford Fusion Hybrid and the Lincoln MKZ Hybrid. Both hybrids earn 41 mpg in the city.